This is the FIRE mandala. 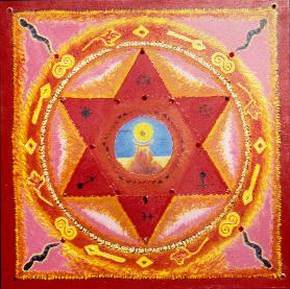 The ritual space is the intersecting pyramids, or Star of David, in the desert at high noon. The spring season brings us new beginnings, change, power, will, courage, strength, purification, generation, passion and the radiance of the sun. The rock formation represent the goddess as an alter and offertory. The union of the male and female elements, inside us all, is represented in the center of the painting as what looks like a sun inside a new moon. The glyph of destiny and the Buddhist symbol of the Pleiades anchor the very center for meditation. The bird is a hawk, the messenger. This painting has an Egyptian theme and the Great Pyramid is indicated with symbols in it’s many chambers. It is hard not to get attached to those moments of effortless flow and hold them up as what we “should” be doing constantly. Watching the creek in my own back yard, though, nature becomes the perfect teacher. The ever changing flow rate, depth of the channel, placement of rocks, even the course of the creek itself, all point out that dynamic balance is what’s real and healthy.